The Onyxx® Embedded Edge Platform consists of a family of modular, open, hardware, bridges and gateways supporting multiple devices across key market segments, edge-to-enterprise and cloud applications. Designed for use in operational and IoT environments, the Onyxx® Embedded Edge Platform enables users to easily implement device data collection and storage, exchange and management capabilities, API management, and event notification within a secured environment. The Onyxx® Embedded Edge Platform provides a selection of connectivity and capacity options to support a variety of applications and configurations. The newest additions to the Onyxx® Edge Platform, the JENEsys® Edge™ products, are a new generation of controllers that combine the Onyxx® platform with the Niagara Framework®. JENEsys® Edge™ products combine a controller, gateway and web server duties all into a single device - putting Niagara at the Edge with real-time control. 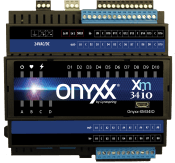 The Onyxx® XM 34IO is part of Lynxspring’s Onyxx® Edge platform of hardware, software and tools designed for today’s buildings, IoT environments, device-to-enterprise integrations and machine-to-machine applications. Designed to provide maximum performance at minimum cost, it is completely extendable and can be configured to add additional IOs to a Lynxspring JENEsys® Edge™ 534 IoT Controller with up to 306 IOs. Today there is an increasing number and variety of equipment, sensors, devices and building automation systems that are available to connect within the environment and the amount of data that is available from them. With this data the challenge lies in how to manage and get useful information out of the data especially as these data sets often come with various formats, naming conventions, and syntaxes. Streamlining the interchange of data from BACnet® devices and building systems, the Onyxx® BH311 BACnet® to Haystack Data Pump provides network communication and data exchange. The Helixx® Framework is embedded in the Onyxx® BH311 Data Pump and handles the BACnet® to Haystack protocol translation between BACnet® points to manageable Haystack points. Acting as a BACnet® client device, the Onyxx® Data Pump manages all BACnet/IP, BACnet/Ethernet or BACnet MS/TP devices connected to it. The Onyxx® CE121 4G LTE Cellular Router is designed to support bi-directional communication, secure, remote access and the exchange of data among today's intelligent buildings, energy management systems, machine-to-machine applications, edge devices and Cloud services. It has been designed for simple set-up, installation, commissioning and includes a wireless modem interface allowing instant communication upon startup. 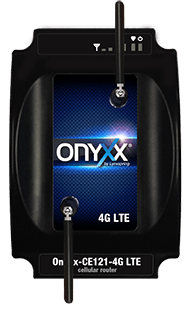 The Onyxx® CE121 4G LTE Cellular Router enables you to remotely monitor and control infrastructure and equipment, meters, pumps and valves in any energy, utility, commercial or industrial application. You may also instantly connect equipment at remote point-of-sale locations, temporary installations, or retail operations and have access to building and energy assets via a secure VPN. To take full advantage of the Onyxx® CE121 4G LTE Cellular Router capabilities, Lynxspring is also offering an E2E Easy Data Service Plan over Lynxspring’s E2E Private Wireless Network. The Lynxspring E2E Private Wireless Network grants you easy access to your systems, devices and equipment using industry-standard Ethernet communications with all the coverage, speed and reliability you need. 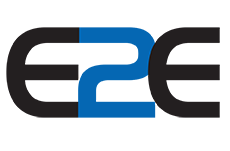 Different from a public network which is based on open and static IP modems, Lynxspring's E2E Private Wireless Network is purpose-built for data traffic only, avoiding the inherent risks of unsolicited traffic from the public internet, malware and viruses. Lynxspring's E2E Easy Data Service Plan is designed specifically to meet those high and low data transmission needs. The Easy Plan is scalable. As you identify new requirements, you can quickly provision additional routers for connectivity. The Easy Plan provides an ideal, cost-effective solution for businesses that require reliable and secure wireless data communications. It delivers many benefits including: Easy set-up and a pre-defined site address, Tier 1 provider reliability, no early termination fees, and a group of devices can pool data for consumption averaging. The plan features up to 1 GB per month with incremental, affordable data usage rates availalbe. You only pay for the data you use. The Onyxx® MB311 Modbus to BACnet® Bridge is designed to bridge the integration between Modbus TCP/RTU communicating devices/systems to BACnet® IP/Ethernet communicating devices/systems allowing for both monitoring and control of the integrated devices/systems. The unit takes Modbus to BACnet® protocol translation to the next level by not only translating Modbus points to manageable BACnet® points but also converts Modbus slave devices into Virtual BACnet® Devices. Acting as the Master Modbus device, the Onyxx® MB311 Modbus to BACnet® Bridge manages all Modbus RTU or TCP slave devices connected to it. 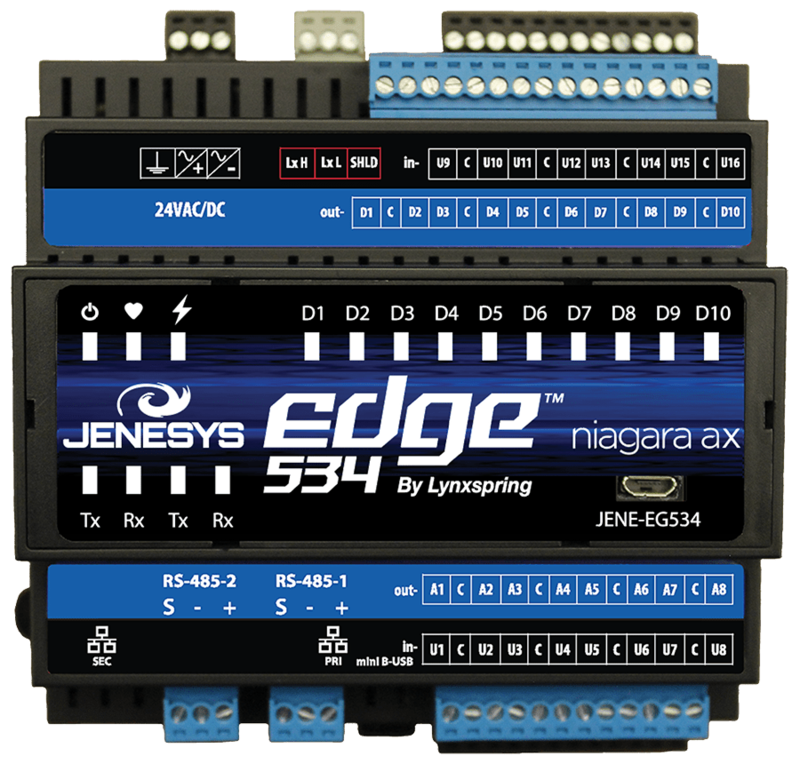 The JENEsys® Edge™ 534 IoT Controller for Niagara 4 is a fully programmable Niagara 4 Controller with 34 IOs built-in and expandable up to 306 IOs, delivering edge connectivity, interoperability, data access and analytics for today's buildings, energy management, machine-to-machine applications and IoT environments. JENEsys® Edge™ products are a new generation of controllers combining the Onyxx® platform with the Niagara Framework®. The JENEsys® Edge™ 534 IoT Controller is a fully programmable Niagara AX Controller with 34 IOs built-in and expandable up to 306 IOs, delivering edge connectivity, interoperability, data access and analytics for today's buildings, energy management, machine-to-machine applications and IoT environments. JENEsys® Edge™ products are a new generation of controllers combining the Onyxx® platform with the Niagara Framework®.